Could it be? Do we have Christmas holly growing on the Preserve? No we don’t, but there is a native shrub called red barberry with prickly leaves and red berries that is quite reminiscent of holly. Its striking berries have led to a number of other common names such as red mahonia, red Oregon grape, red holly grape, Mexican barberry, bloodberry barberry, and desert barberry. 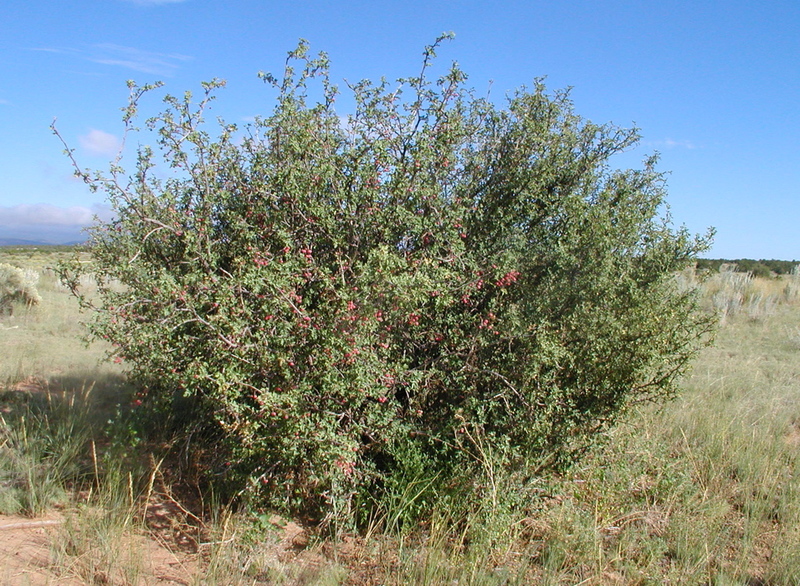 Berberis haematocarpa is one of six Berberis species native to New Mexico (to date, I have only found one other species, B. repens, on the Preserve). The genus name Berberis comes from the Arabic word for barberry fruit, berberys. 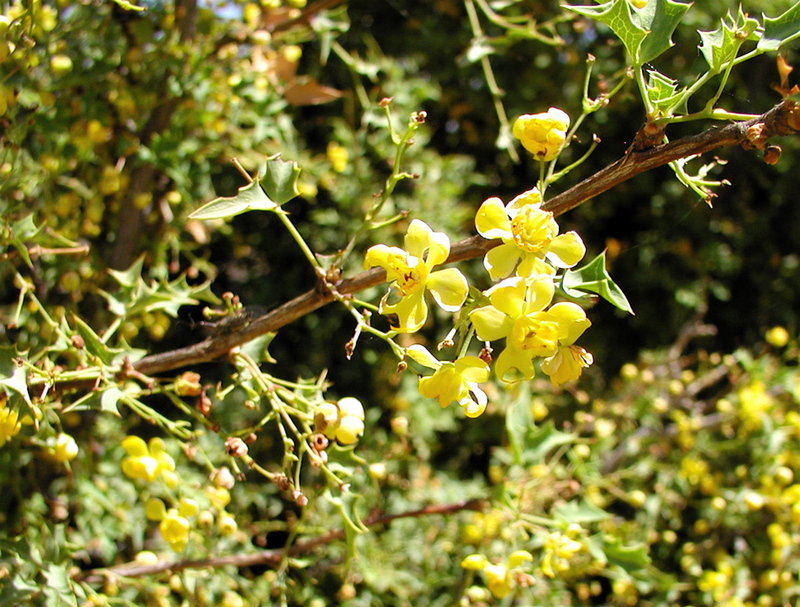 The barberry family, Berberidaceae, contains plants characterized by yellow-colored inner bark and flowers with six petals and six stamens. 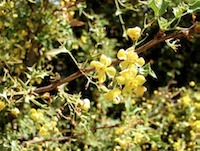 The family has fifteen genera worldwide, but only Berberis occurs in New Mexico. The specific epithet of red barberry, haematocarpa, comes from two Greek words; haima meaning blood and karpos meaning fruit. Berberis haematocarpa is often called by the Spanish name algerita, but that name, like many of the common names for plants, is rather imprecise because it is also often used as the name for one or more of the other native species of Berberis. Red barberry is an evergreen, upright, long-lived shrub that may get as large as 12 feet tall and 12 feet wide. It grows from a deep root capable of producing a trunk up to one foot thick. Older stems have a gray-purple colored smooth bark, and younger branches are typically stiff and erect. 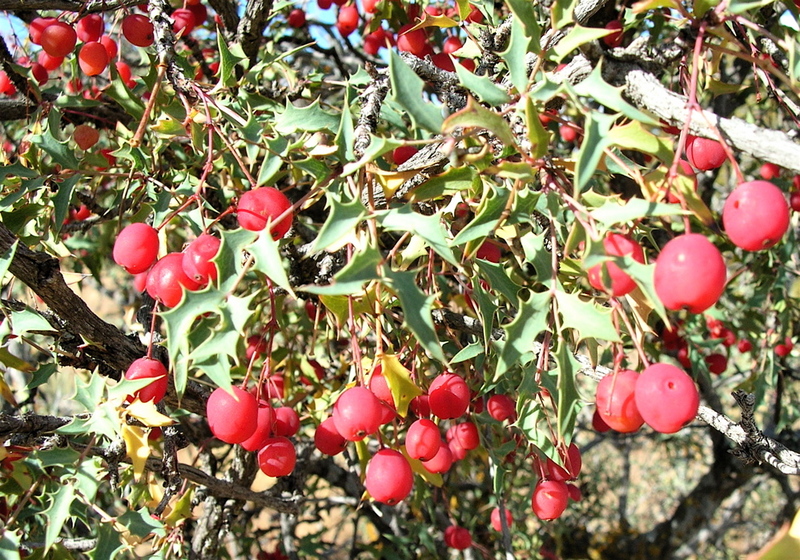 The leaves of red barberry are pinnately compound with up to nine odd-numbered leaflets per leaf. Each leaflet is thick and rigid with a smooth waxy surface. The edges of the gray-green or bluish-green leaves are usually wavy with stiff spines making the overall plant quite prickly even though the branches themselves do not have spines. Red barberry plants flower in the spring, usually in mid-May on the Preserve. Loose clusters of three to seven small (about one-half inch) yellow flowers dangle from short stalks. Individual flowers look somewhat like miniature daffodils and consist of nine yellow spreading sepals, six yellow erect petals, six stamens, and one pistil. Flowers are produced in great profusion and are quite fragrant, so red barberry plants in full bloom are a true visual and olfactory treat, but unfortunately the flowers only last a few days. The red fruits that develop from the flowers in mid-summer are juicy and edible, although quite tart. About one-quarter inch in diameter, the smooth, round fruits contain purple seeds and may be used to make jelly or wine.